Few creatures embody both gentleness and power like the horse – a duality that is most striking in the heavy horse. For a thousand years it has been both warhorse and workhorse, faithfully doing man’s bidding, often to the point of its own demise. Long since superseded by technology, replaced by tanks on the battlefield and tractors on the farm field, what does the future hold for the draught horses, the beasts of burden on which we once depended for so much? ‘We owe these horses such a lot in terms of what we have been able to achieve that we should take care of the breeds even though their use as working animals is over,’ argues Taya Street. She is very much her father’s daughter – the horses come first, then the horses, and after them the horses. They are what brought former builder Richard Street and his wife, Elaine, to take on a run-down farm and stables on the Edmondsham Road out of Verwood some fifteen years ago and, despite the awful initial loss of eight animals to the effects of previous neglect, to give their all to establish the Dorset Heavy Horse Centre as a family farm park and conservation centre. Today it is home to 23 heavy horses, representing all five native breeds – Shire, Clydesdale, Suffolk Punch, Ardenne and Percheron – as well as the Gypsy Cob, miniature pit ponies and Shetlands. The heavies are descended from warhorses brought to Britain by the conquering Normans in 1066 and bred for their power and strength to carry fully armoured knights into battle, but as military requirements changed, their chargers were put to other work. In their millions they became the engine of British industry, toiling in fields, forests and factories, on docks and in mills, alongside canals and in town and city centres before going back to war in the 20th century in both global conflicts. Their numbers fell from around half a million in 1939 to about 5000 in the early 1970s and are down to 3500 today. 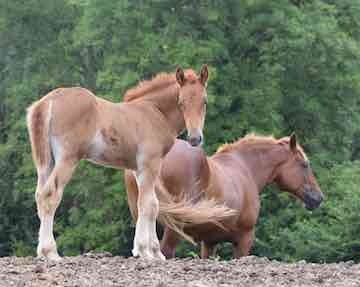 The Shire and Clydesdale are both listed as at risk by the UK Rare Breeds Survival Trust and the Suffolk Punch, the only heavy horse bred for agriculture not war, is critical. It is rarer than the Giant Panda, with less than twenty breeding stallions and only about eighty mares; some predict the breed’s extinction by 2027. No wonder the Dorset Heavy Horse Centre is so proud of Lilly Rose, its year-old Suffolk Punch filly, born last June to Abbey Rose, who arrived at the farm park last year with nine-year-old gelding Uno. The heavy horses live together as a herd with its own hierarchy headed by Adam, the last of the Shire horses that were on the farm when the Streets arrived. Born in 2001, he had been badly neglected but is now fully recovered, physically and psychologically. ‘We leave them to find their own level, but Adam is very much in charge – although we have a very assertive Shetland stallion who doesn’t care about size,’ laughs Taya. Fortunately, the miniatures live separately, but all the horses spend most of the time in the field, so only come into their stables just before the park opens in the morning and go back out around 3.30 once they’ve finished work. 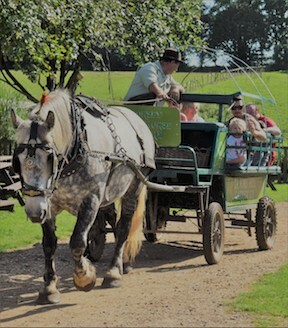 And there’s a full timetable each day, with jobs including pulling carriages and wagons for rides, modelling for harness displays and being ready and receptive for feeding. Even the miniatures get in on the act, drawing carriages for children’s rides, delivering feed on mini-wagons and indulging younger visitors who want to learn how to groom ponies. Other activities include tractor driving and trailer rides, feeding the farm animals and collecting eggs, tending the farmer’s garden and meeting the cuddlier animals in Pets’ Corner. Static displays re-create a traditional village blacksmith’s forge and harness-makers, a canal scene and the Grains Hill Colliery, where the pit ponies apparently await their next shift. There is also a small but impressive collection of Romany caravans and working vintage heavy haulage vehicles including ‘Old Basil’, a 1929 chain-driven Scammell tanker, ‘Sir Ted,’ a 1967 Scammell Highwayman that finished its working life hauling British steel, and ‘Sir Winston’, a 1951 Scammell Explorer cross-country lorry that is regularly employed pulling the beautifully restored 1927 Showman’s Living Wagon made by famed fairground ride builders Savages of King’s Lynn. ‘It weighs eight tonnes and was originally pulled by horses – no wonder those wagons were known as “horse killers” because they couldn’t be controlled running downhill,’ explains Taya, who was taught to paint in gypsy style by her father and last winter helped bring a beautifully proportioned 1936 Brayshaw Living Wagon back to life. Their labours have produced a ramshackle walk-through that looks and feels thoroughly authentic. Created without professional designers or interpretation copywriters, the equine war story is told as simply as possible on a series of boards and the trench incorporates sets with a field kitchen, sleeping quarters, lookout posts and a position grimly labelled ‘Sucide (sic) Corner’. Rough-sawn planks and sheets of rusty corrugated metal hold up the walls of the trench and the mud floor is solid or sodden depending on the weather. It is typical of the Dorset Heavy Horse Centre in that it is proudly, defiantly even, hand-made. This is not a glib theme park operation with a glossy gift shop and staff bedecked in cod-rustic costumes, far from it. Instead, the sense is of a going concern founded on one man’s idiosyncratic vision – carried forward by his family – of what might be possible with a bit of luck and lot of hard work. ‘We weren’t a horse family at all – Dad was a builder for twenty-five years,’ says Taya. ‘Then he learnt how to do gypsy painting and decided to do gypsy caravan holidays, so he bought a caravan, got a Cob, some harness and a book and now he’s a walking encyclopedia on heavy horses. The way the park has turned out, certainly with the conservation side of things, is largely a result of what had happened here before. Some of our horses come from the RSPCA or from people that are no longer able to look after them, but we also have some animals that were headed for slaughter – they have a meat value. 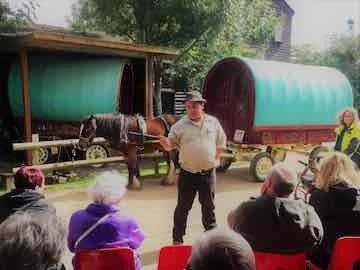 It’s up to us to educate people about heavy horses so I go out and give talks in schools and we have school groups here, especially with War Horse being in the National Curriculum.